Last summer on my way to an appointment, I spotted a mid-century modern two seat lounger on the curb. 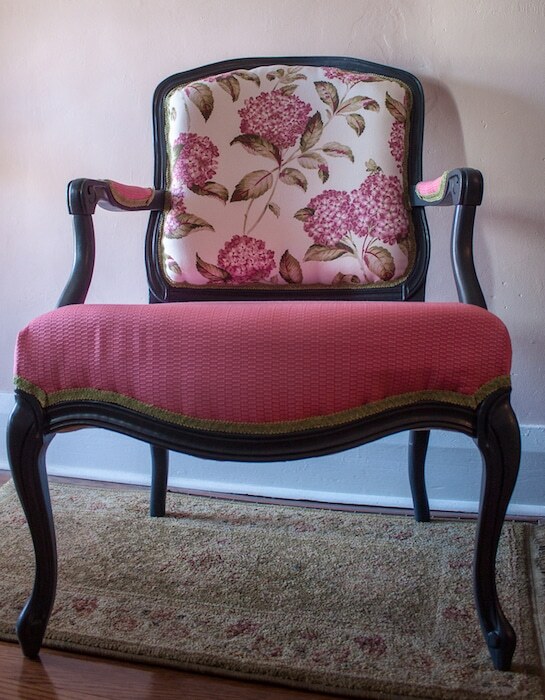 The upholstery was awful, but the lines of the piece were sleek and modern. When I reached my destination, I called my husband and asked him to look at the piece and to bring it home if he thought it was worthwhile salvaging it. When I arrived home it was sitting on our back deck. The upholstery fabric shouted 1970’s and called for shag carpet. The wood was in great condition, but only three strips of the webbing were not broken. Sitting on the piece was a very delicate matter! We purchased new webbing and easily fixed the seat. The wood was cleaned and waxed. 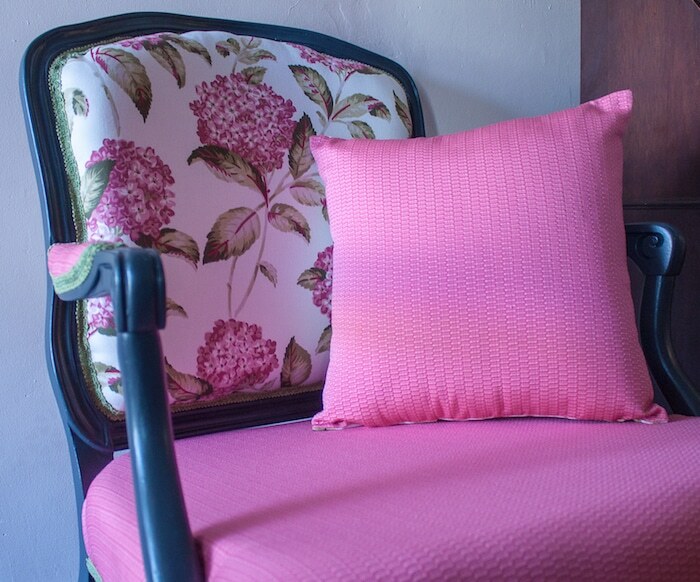 The upholstery fabric absolutely needed to be changed! I decided that instead of four cushions I wanted to have two. 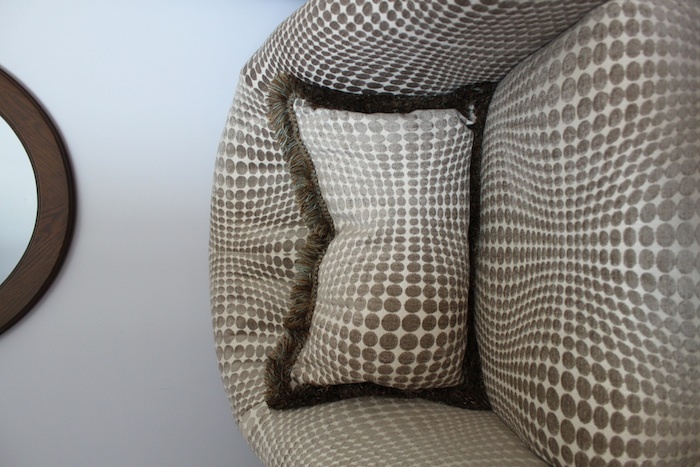 That way I only needed to put in two zippers instead of four and two cushions would look more modern and streamlined. 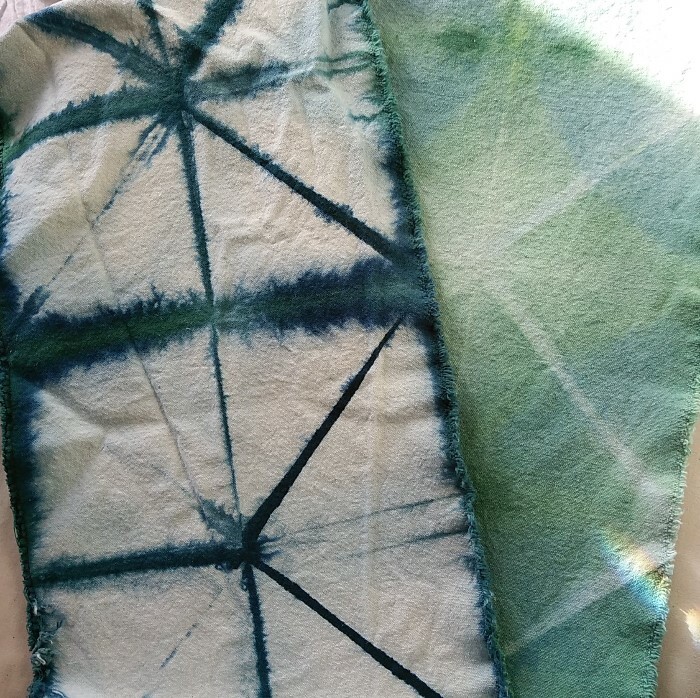 I had been hand dyeing fabrics and scarves and wanted to try dyeing larger pieces of fabric. 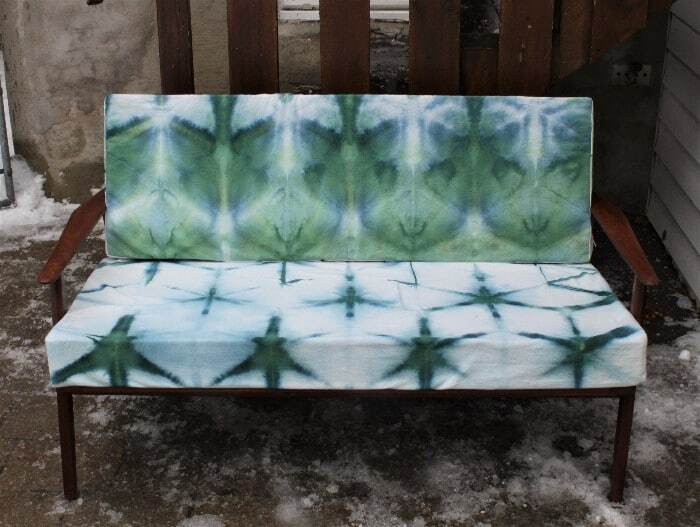 I was certain I could create an interesting hand dyed piece to use for the cushions. 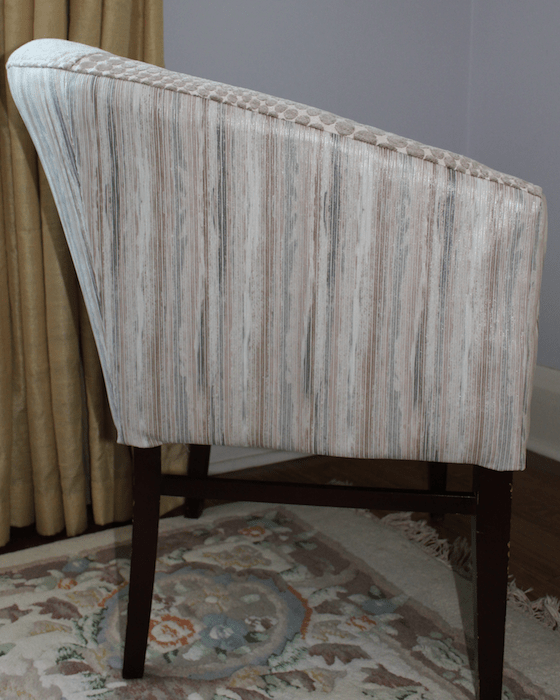 I split the canvas into 2 pieces one for each cushion and cut off a long narrow strip that would be used on the sides. The piece above shows the two ends of the same long strip! 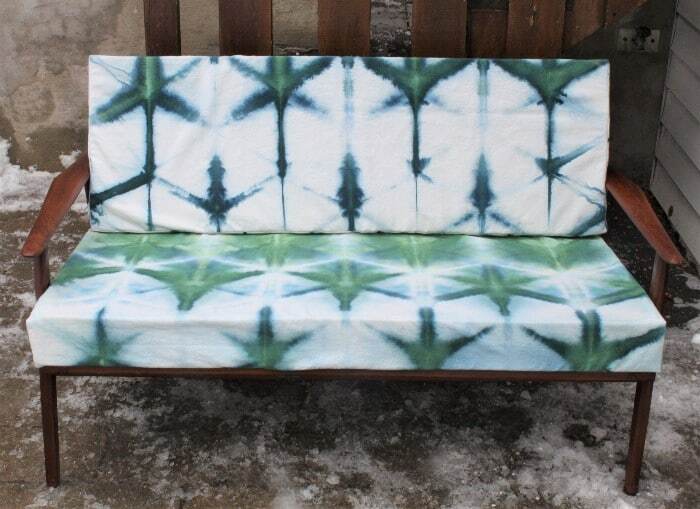 I snow dyed the fabric and am so happy with the results. The cotton canvas was fan folded and then folded into a triangle. The result of the folding was a tall stack of fabric. I decided to rest the stack of fabric on the bottom of the plastic tub instead of having it suspended above the melted snow. 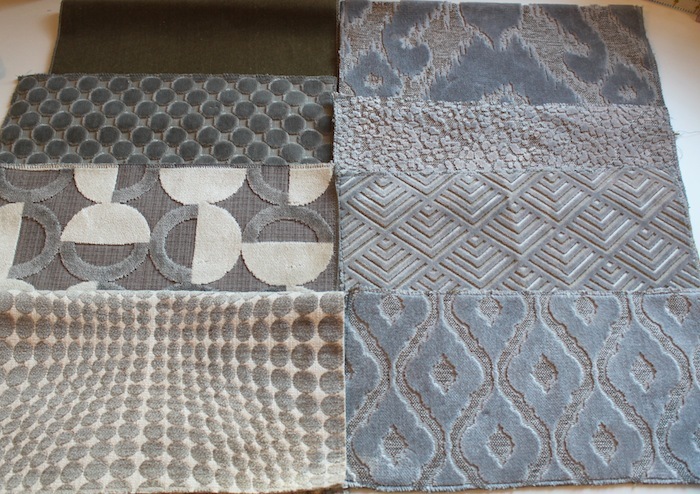 As you can see when looking at the photographs, there is a distinct difference in the fabric. The part of the canvas stack sitting in the melted snow absorbed more dye. In the photo above, the cushions show the portion of fabric resting above the melted snow. The design is sharper with more white visible. 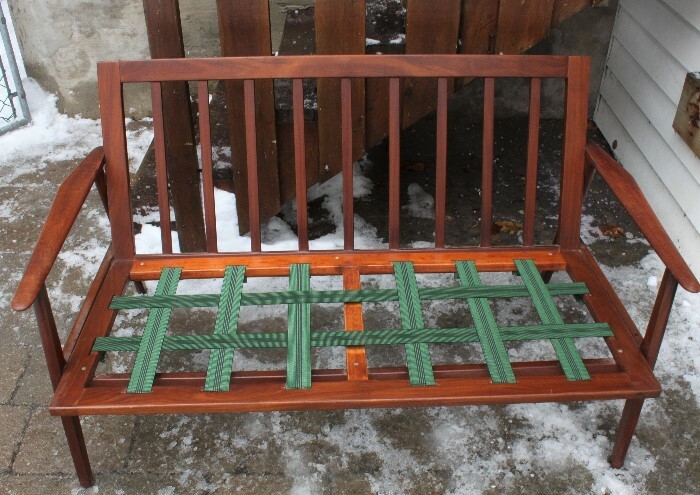 In the photo above, the seat cushion shows the part of the cotton canvas that was eventually submerged when the snow melted. 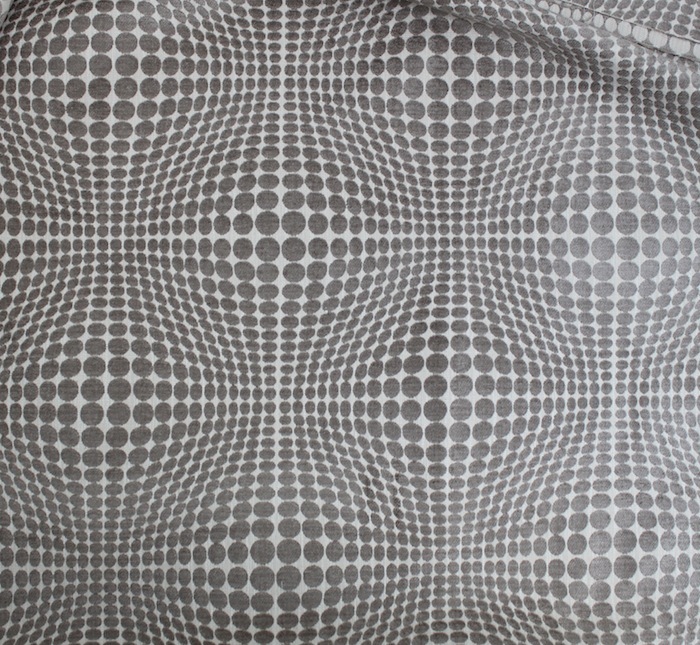 This created a softer less distinct pattern. 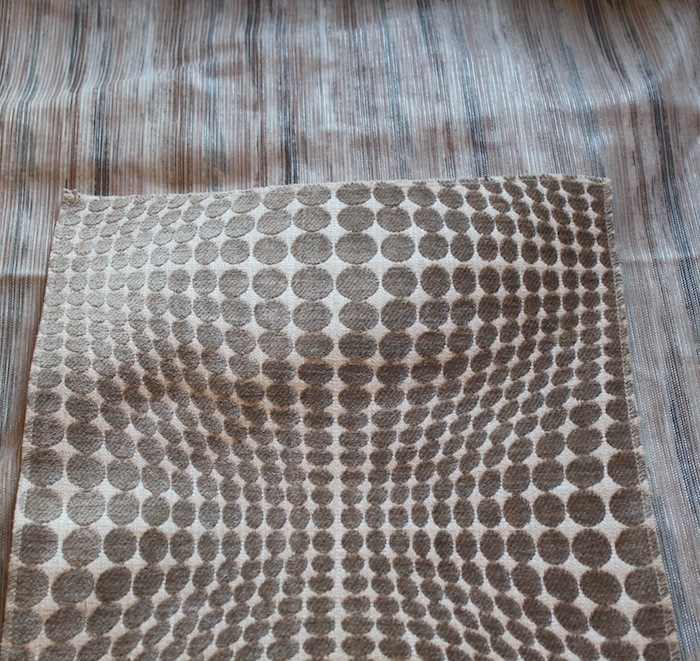 In the photo below, it’s the back cushion fabric that was submerged. 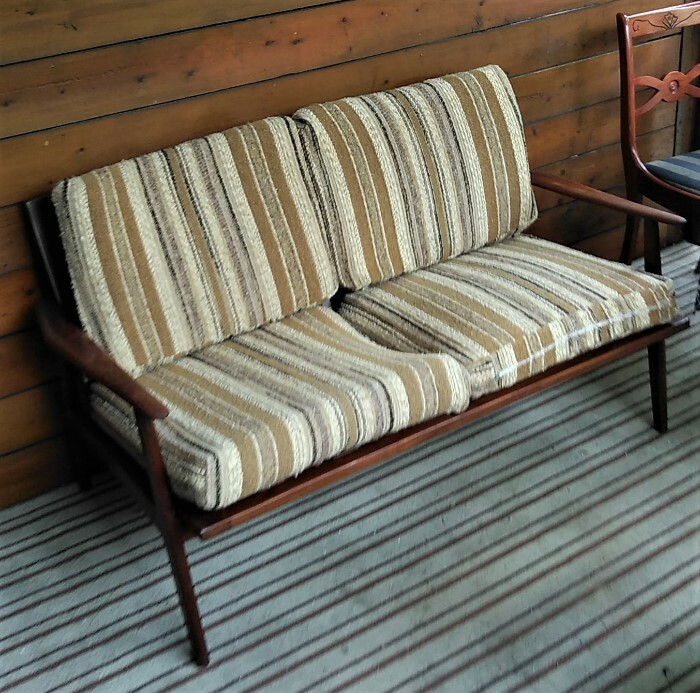 We will be placing this mid-century modern lounger outside on our deck when the weather turns warmer. 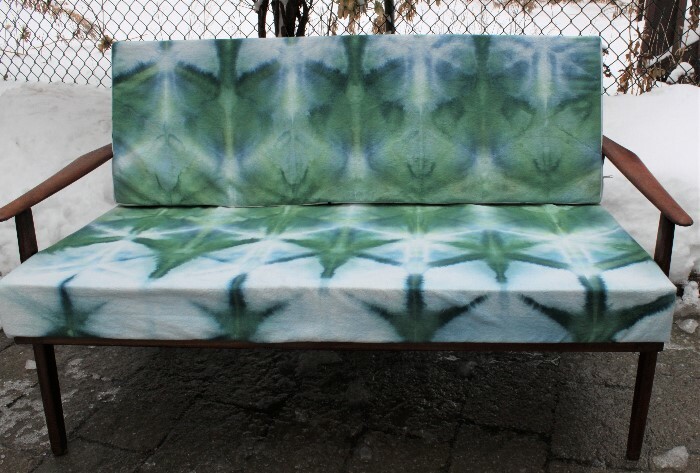 This summer we will be sitting in style! 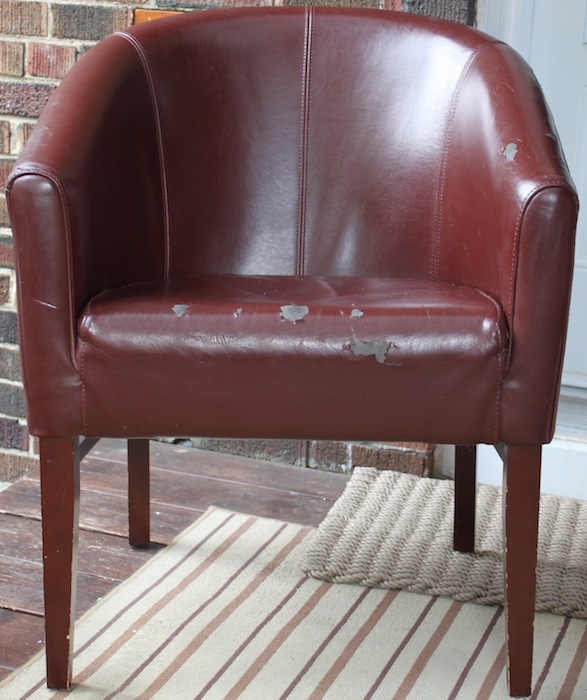 In the early summer I posted photos of our leather barrel chair that was in desperate need of being reupholstered. I chose fabric, stripped off the old leather and then it sat, and sat and sat taking up space. Finally, I had the time to work on it during the holiday break. This is our new chair. I love the beautiful colours of the stripped leather that I found at Designer Fabrics. 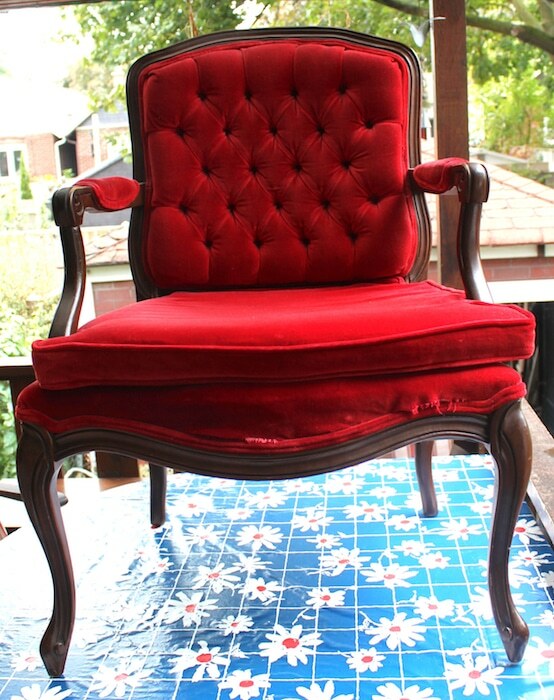 I was able to get enough of the leather in two pieces to do the outside of the chair. 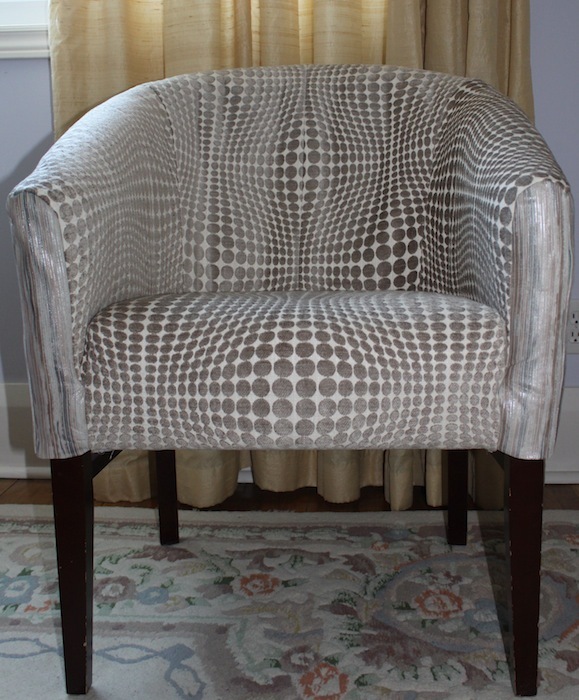 The inside of the chair is a beautiful op-art piece of upholstery fabric. I love the dimensional look it has. With the leftover bits, I made a pillow and added a beautiful fringe repurposed from an old pillow. It feels great having completed this project after such a long time. How long does it take you to complete your projects? 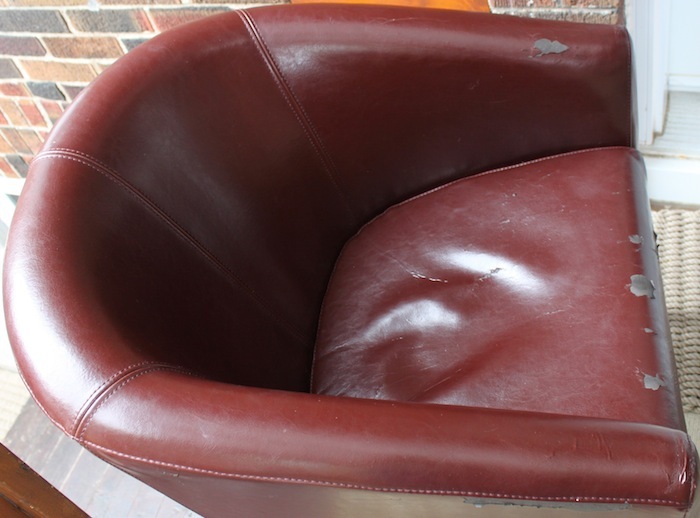 This is a barrel chair we’ve had for a few years and the upholstery was the worse for wear. I found a beautiful piece of leather in stripes of cream, grey and beige. 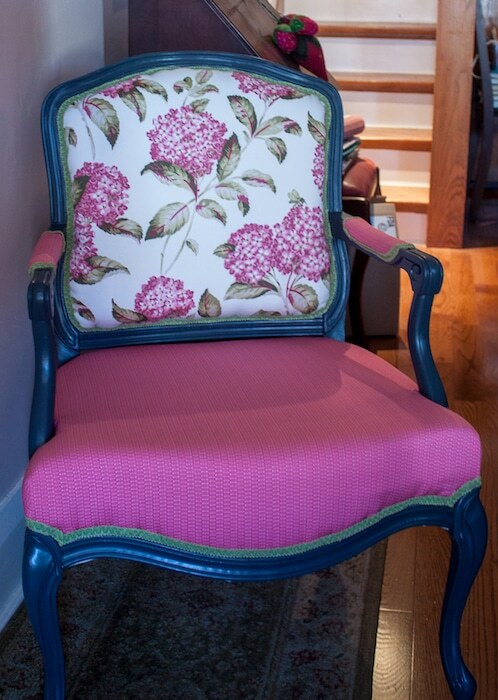 There wasn’t enough to redo the entire chair, but enough to use on the outside. A trip to Designer Fabrics, a store that has a great selection of fabric was needed. I love going in to browse, there is always something new to look at and fondle! I brought a selection of samples home. I like the idea of having a circular design to contrast with the linear stripes. The design below is the one I liked the best. It is a wonderful, op art designed cut velvet. I hope to start this project soon. I have already removed the old upholstery. 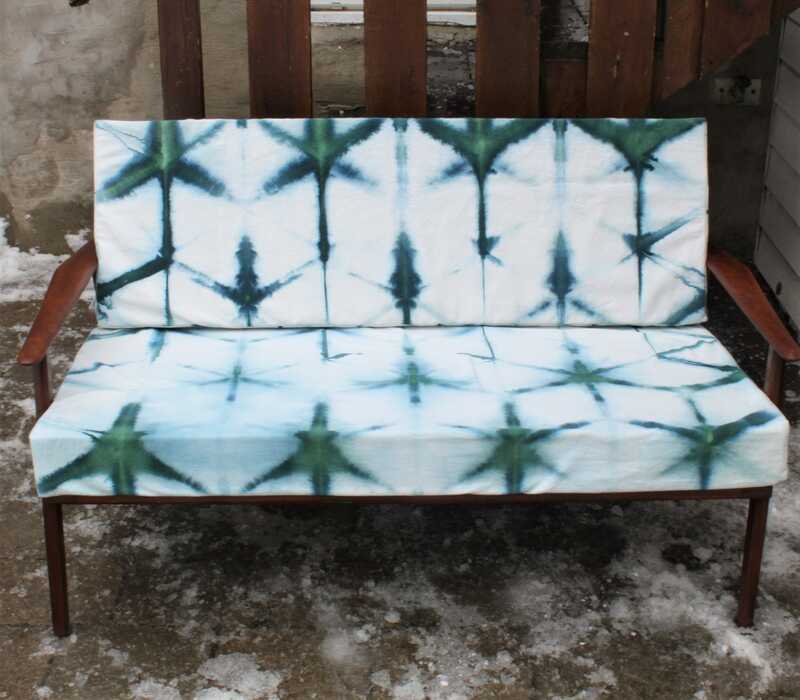 I think it will look great in our room and with the new indigo pillow I dyed!